A leaked letter apparently written by the now home minister has surfaced on social media repeating claims that President Abdulla Yameen was linked to the 2012 murder of MP and cleric Afrasheem Ali. The letter – apparently from Umar Naseer, who went on to become home minister in 2013 – is addressed to ex-president Maumoon Abdul Gayoom and asks him to refrain from supporting Yameen because Naseer has concrete evidence linking Yameen to Afrasheem’s murder. However, Naseer tweeted on Wednesday: “A forged letter in my name is being distributed on social media”, and claimed that the signature on the letter was different from his own. Naseer has a history of making such claims against Yameen, but retracted them when he joined the government in 2013. Yameen denies allegations from the opposition of corruption and affiliation with criminal groups. The letter received dozens of retweets, with many social media users linking it with previous public comments by Naseer making accusations against Yameen – although one Twitter user labelled it an “April fool”. At a 2013 rally, Naseer accused Yameen of having illicit connections with gangs, the drug trade and the murder of Afrasheem. His comments followed his defeat by Yameen in the ruling Progressive Party of the Maldives presidential primaries. Naseer said he had witnessed a visit to Yameen at the PPM’s office by a suspect who was arrested and questioned by police over Afrasheem’s murder. Naseer was subsequently dismissed from the party and went on to back Jumhooree Party (JP) candidate Gasim Ibrahim. He was appointed home minister when the JP joined the ruling party in a coalition, but after that coalition later broke up, he stayed in government and rejoined the PPM. In an exclusive interview with Minivan News in January 2014, Naseer described his allegations against Yameen as merely “political rhetoric”. “We were repeating MDP’s lines. What happens in presidential primaries is that you are competing for the top position of the nation, so you use every tool you have. I am now the home minister, but I do not see any indication of [Yameen] being involved in such acts,” said Naseer. Afrasheem, an MP for the PPM representing Ungoofaaru constituency in Raa Atoll and also a moderate religious scholar, was stabbed to death outside his home on the night of October 1, 2012. Police said the killing was politically motivated. He was known for taking relatively liberal positions on some religious issues, which had prompted criticism from other clerics. On a TV talk show on the night of his death, Afrasheem had apologised for “misunderstandings” over some of his religious views. 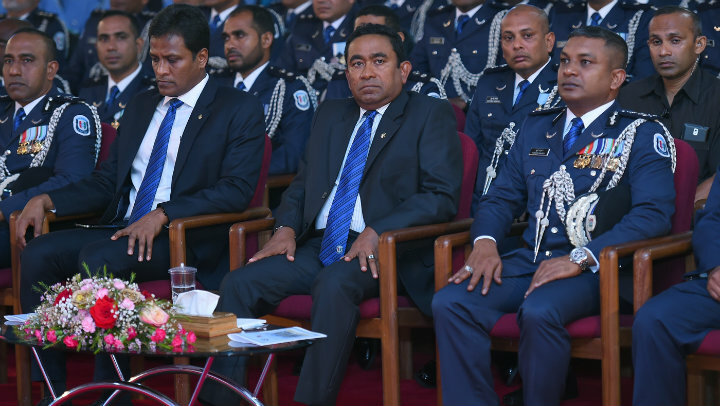 A 2012 UNDP study of the Maldives’ gang culture found that “political and business elites” exploit gangs to carry out illegal activities including the suppression of opponents and carrying out tasks to help maintain popularity or divert media attention from political issues. There have also been growing links between gangs and religious extremists, with a series of secularist bloggers apparently targeted because of their views. The man always speak with a fork tongue! Believe him for once; you had it!